Twelve people were killed in clashes between police and anti-government protesters in the town of Beni-Sueyf, located 100 kilometers south of Cairo on January 29. 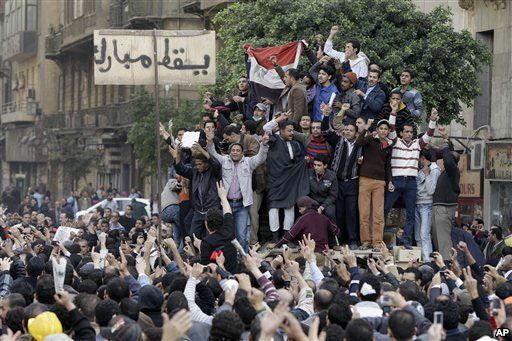 According to official data released by the Egyptian authorities during the day on 29 January, as a result of unrest in the country killed at least 35 people, including 10 policemen. According to unofficial information, the list of killed at least 100 people. Egyptian President Hosni Mubarak has declared a curfew in the cities of Cairo, Alexandria and Suez from 6:00 pm (16:00 GMT) until 7:00 am (05:00 GMT). Mubarak, as commander in chief, has asked the army to take charge of security along with the police, and to ensure the implementation of the curfew, state television reported on Friday. Mubarak “has asked the armed forces, in cooperation with the police, to implement the decision, and maintain security and secure public establishments and private property,” it said.